It is hard to believe that our coffee-drinking habits can be attributed in part to a man from Allegheny City, Pennsylvania with a vision. Brothers John and Charlie Arbuckle moved to Brooklyn in 1881 to become the greatest coffee roasters of their generation in the 1860s. 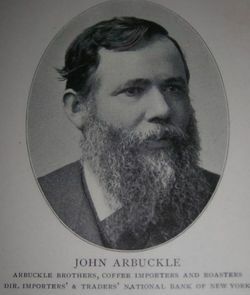 Arbuckle invented a machine that efficiently roasted, ground, and packaged coffee into small bags for mass distribution throughout the country. Prior to this innovation, coffee beans had to be sold unroasted from barrels and were easily spoiled. These beans burnt easily as they were roasted at home. Their first national brand was patented under the name “Arbuckle Ariosa”. Coffee was stored in Empire Stores Warehouse. Photo by Berenice Abbott, 1936. 1880s advertising card for Ariosa coffee showing Arbuckle's Brooklyn coffee plants. Arbuckle patented a unique egg-and-sugar glaze that prolonged the freshness of their coffee beans as they were transported west. In 1887, Arbuckle launched a sugar refinery at 10 Jay Street when Havemeyer Sugar refused to lower prices for their biggest customer. 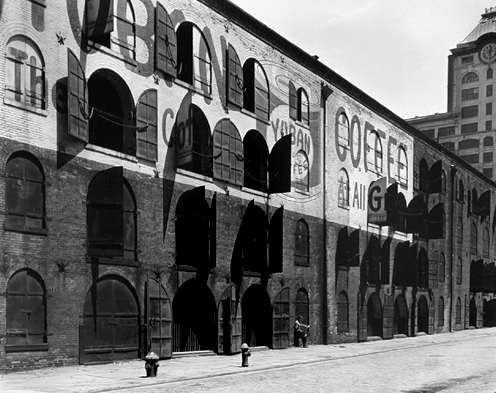 Havemeyer went into the coffee business in response, resulting in depressed coffee and sugar prices for years. Arbuckle eventually built up much of the real estate along Jay Street in what is now the DUMBO section of Brooklyn. The Deep Sea Hotel provided lodging for low-income working adults. Photo from Library of Congress, 1913. Dining area in Deep Sea Hotel. Photo from Library of Congress, ca 1910. Instead of donating money to charities, John Arbuckle took it upon himself to find solutions to societal ills. 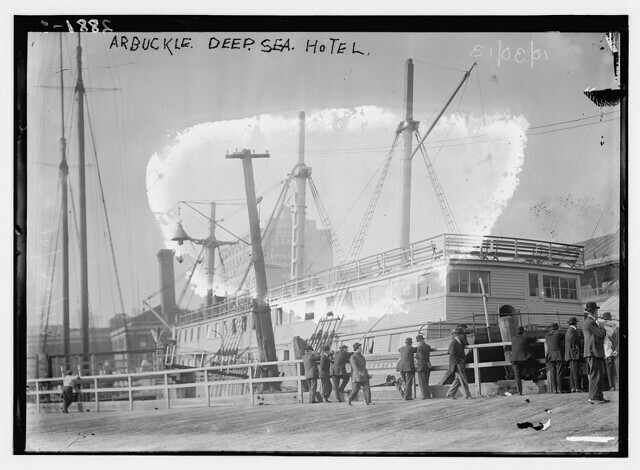 Noticing the overcrowding and poor air quality in the tenement slums of New York City, Arbuckle renovated ships into floating recreational centers for the poor. These ships offered areas for dining and physical activities for those who could not escape from the filth and noise of the city. 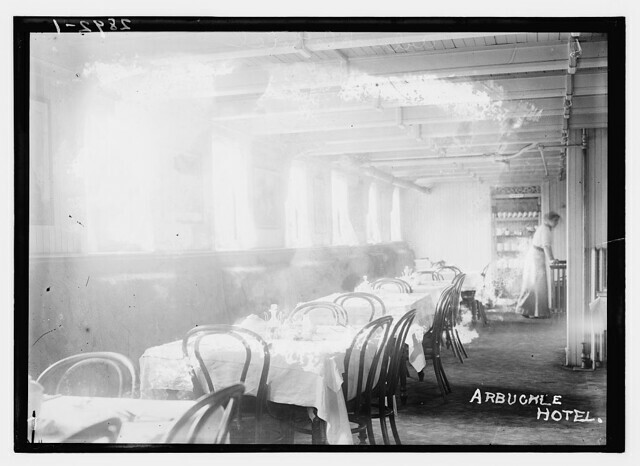 Although he had good intentions, Arbuckle’s ideas did not last but the ships continued to provide low-cost meals and job training sites for people with little means. 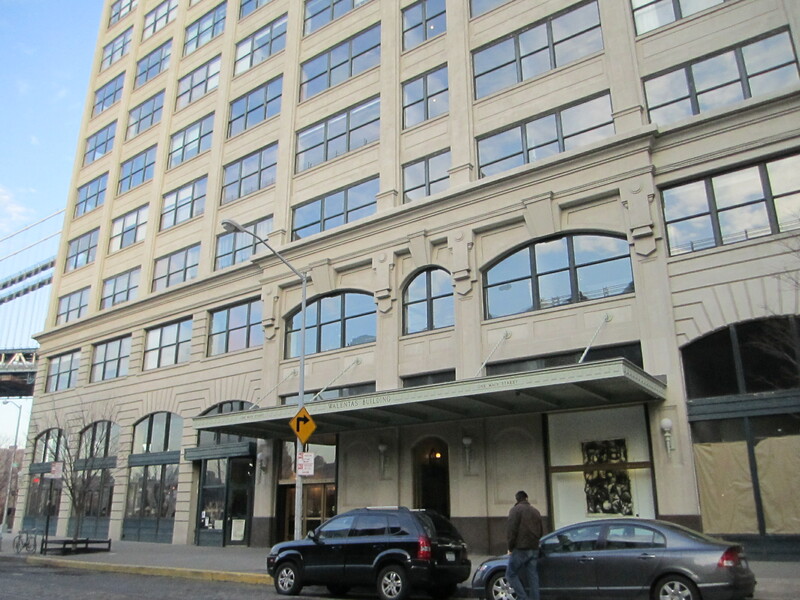 25 Jay Street, currently for residential and commercial use. 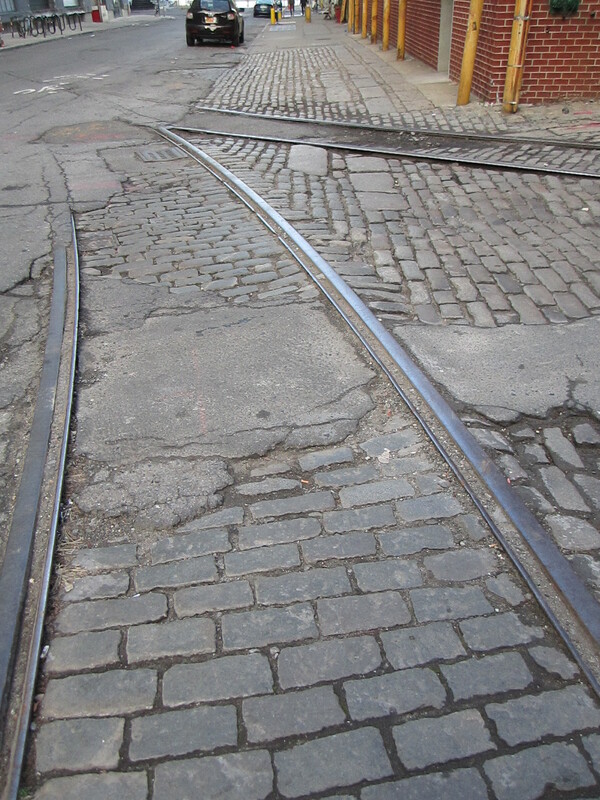 Former tracks of the Jay Street Connecting Railroad, owned by John Arbuckle and used to shuttle cargo from the East River into warehouses. 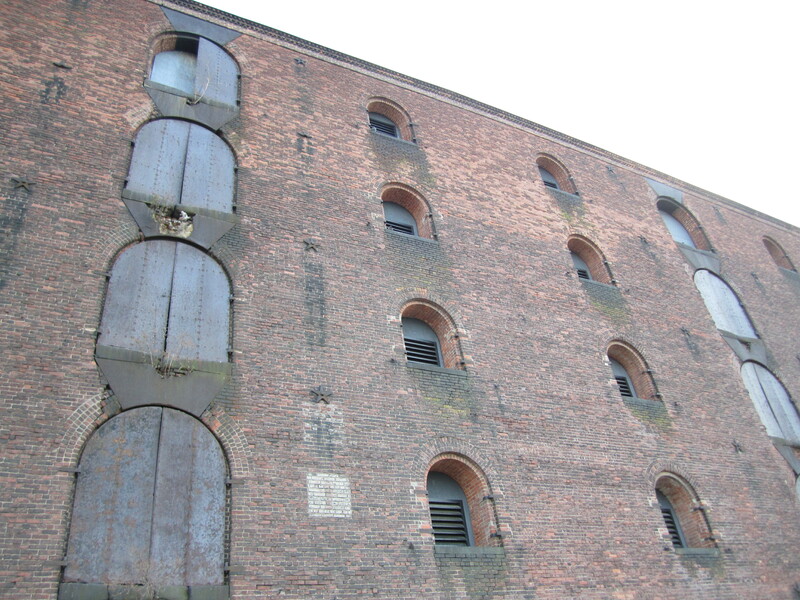 The Empire Stores Warehouse today. Empty and dilapidated, but still standing. By the 1940s, most of Arbuckle’s buildings in Brooklyn were being used by other businesses. Today it’s not hard to imagine what Brooklyn manufacturing must have looked like at the height of the Industrial Revolution. Visitors walking around DUMBO can find large warehouses made of brick and concrete. The Empire Stores Warehouse continues to exist as a dilapidated site, but developers are hungrily eyeing the building while the court system determines who has rights to oversee its transformation. 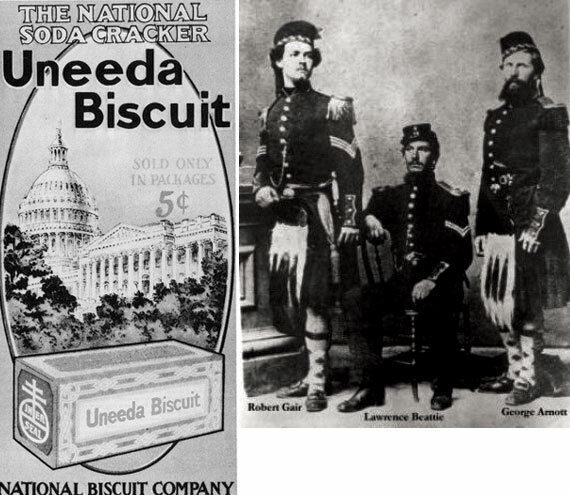 Left: Advertisement for Uneeda Biscuits. Right: Robert Gair and the 79th New York Highlanders of the Civil War. When people think of New York business titans, they often think of families like the Rockefellers or Astors. The name Robert Gair may not ring any bells, but he is largely responsible for that cardboard box that contains the breakfast cereal you eat in the mornings. Immigrating from Edinburgh, Scotland in 1853, Gair was originally a plumber’s apprentice with his father in New Jersey. Later on he worked in New York at a retail dry goods store. At age 21, he cast his first ballot for Abraham Lincoln. 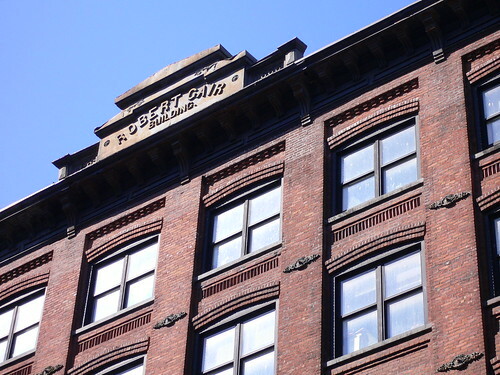 After serving in the Union Army during the Civil War, Gair opened up his first paper factory in 1864 with $10,000 in capital; the factory was in a small loft at 163 Chambers Street in Manhattan. Other sources state he had a space on Reade Street as well. During the Civil War, cotton had become scarce and pantry staples like flour and sugar began to be packaged in paper bags. After the war, fabric was used once again to package flour but Gair saw potential in the use of paper packaging to market dry goods and household items. In 1879, after a worker accidentally cut through 20,000 paper seed bags, Gair serendipitously developed a method to more efficiently produce cardboard boxes by printing, cutting, and creasing cardboard in one fell swoop; prior to this discovery, cardboard box-making was labor-intensive and expensive. Gair's first buildings used brick in its construction. 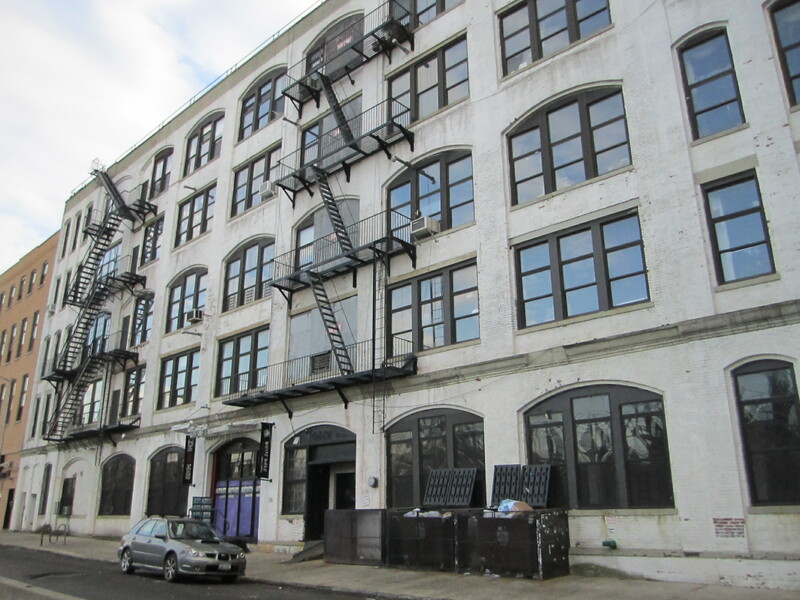 Looking for a more spacious location with better access to transport, Gair built two six-story brick factory buildings at 25 and 30 Washington Street between Water and Plymouth Streets near the Brooklyn waterfront. In 1909, Gair employed the Turner Construction Company to design buildings made of reinforced concrete, an innovation that was cheaper than brick during the time. Eventually Gair built a series of buildings in present-day DUMBO, all connected by railway lines, underground tunnels, and eventually, aerial bridges; the neighborhood was sometimes referred to as “Gairville”. 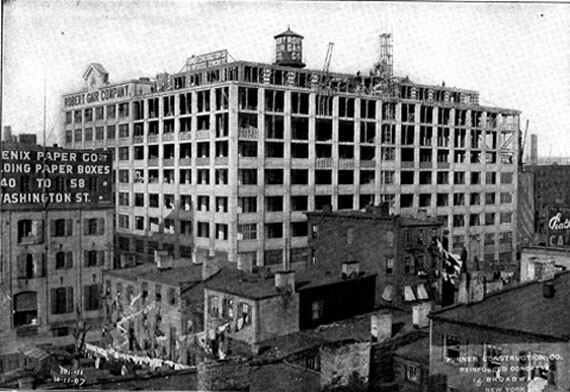 Robert Gair Company Paper Goods building on Front Street, 1909. Courtesy of Greater Astoria Historical Society. The Gair Company produced packaging for Bloomingdale’s, Colgate, and Pond’s. His big break came when Nabisco used his cardboard boxes to package their Uneeda Biscuits. Before then, crackers were stored in barrels and general store owners had to fish them out one by one for customers; crackers became stale quickly and old product was often mixed in with new. The use of cardboard boxes ensured freshness in uniform packaging, and it wasn’t long before cereal companies came knocking on Gair’s door. Gair had correctly predicted that the aesthetic design of packaging could influence consumers’ buying decisions. His cardboard packaging changed the way goods were displayed and often resulted in higher product sales. 1 Main Street, aka Clocktower Building, built in 1914 for Robert Gair. It was the tallest reinforced concrete building in the world at the time of construction and was considered the signature building in Gair's real estate holdings. 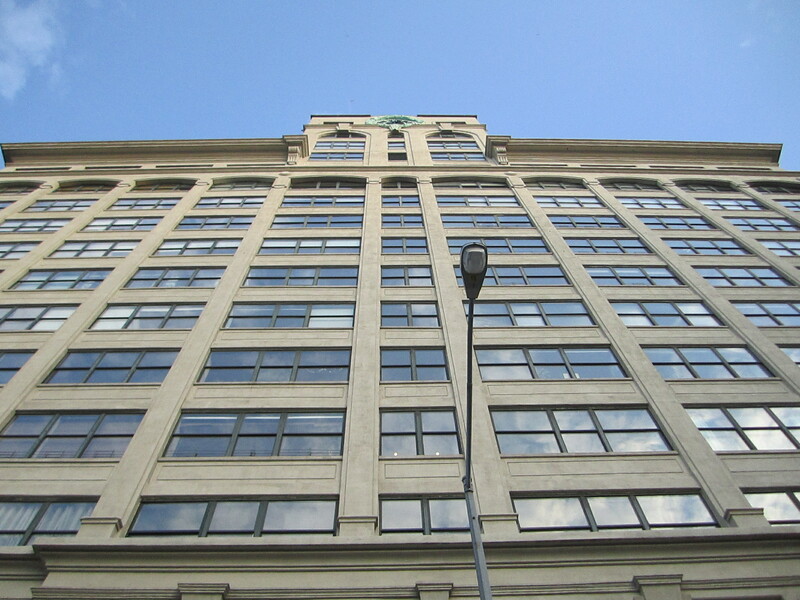 The Clocktower Building is presently a luxury condominium residence with a penthouse unit renting for $50,000 a month. Flywheel in Piermont, NY. All that remains of Robert Gair's upstate operations. Courtesy of Piermont Library. In 1917, Gair began giving his 3,000 workers the day off on Saturdays during the summer so “they could work in their gardens”. Later on he instituted half-days on Saturdays during the remainder of the year. By 1919, the company’s shareholders had determined that the company could be more profitable if it moved its operations closer to the source of its raw materials. 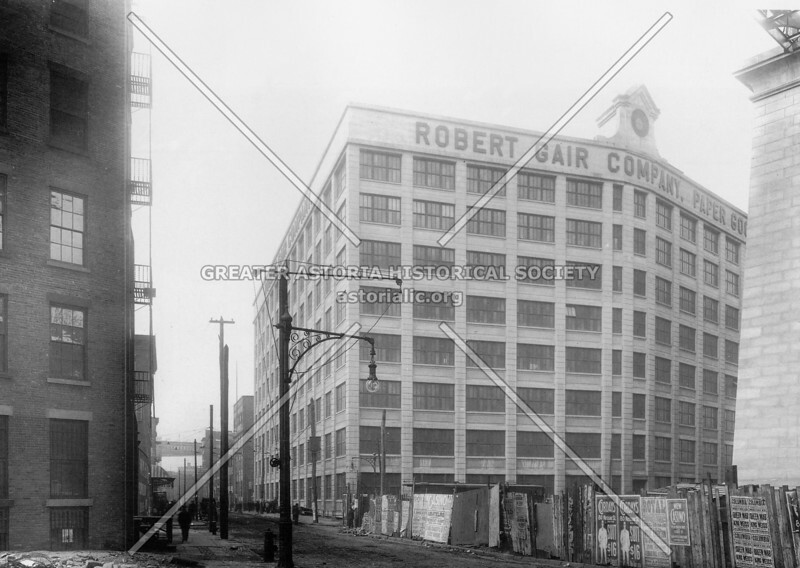 In 1926, the Gair Company moved to Piermont in Rockland County and Gair Realty Corporation began advertising for tenants in their now-empty Brooklyn buildings. By the time Gair passed away in 1927 on his 88th birthday, he had six factories in the nation, the biggest being in Brooklyn. The Gair Company was acquired by the Continental Can Company in 1956. The Gairville Buildings, all 1.8 million square feet, were acquired by Helmsley-Spears, who in turn sold the properties to David Walentas in 1981 for $12 million, or the jaw-dropping price of only $7 per square foot. These buildings have since been renovated into residential lofts and commercial spaces.